If your closet is starting to look like a bad ‘before’ photo, it’s probably a sign that it’s time to declutter. 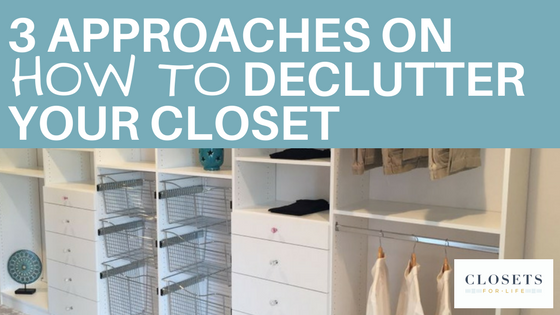 But don’t despair, there is more than one approach to declutter your closet space. Whether it’s a mudroom closet, a craft closet or a bedroom closet, here are three approaches to getting your closet looking and feeling clean, calm and organized! This can be hard for some of us. We know! However, physics laws simply can’t be ignored. If you keep adding items without getting rid of anything, you will eventually run out of space. Can’t even imagine how to start sorting out what you should keep and what should go? Check out our previous blog, 5 Steps to an Organized Closet, that will walk you through a sure-fire (and relatively painless) process getting your closet back into shape. Approach #1 to difficult to face? Or, did you get rid of stuff and still have more than can comfortably fit? 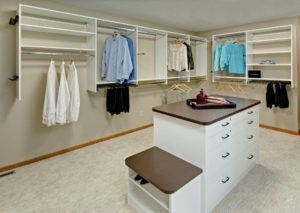 You might want to consider a custom closet system, especially if you still have the single bar and shelf in your closet! A customized closet system will change your world (well, your closet world anyway)! With options to add shelving, drawers, islands, shoe racks, pull down closet rods and more, you can easily double or triple your storage space with a custom closet system. As a bonus, a custom closet system will also have a positive affect of your home’s resale value. Not sure what you want? Check out our custom organization photo gallery. You’ll find photos of organization projects of all kinds, from walk-in and reach-in closet systems, to mudroom organization, home office organization, garage organization, home wine cellars and more. Maybe you already have a custom closet system or perhaps a closet system just isn’t in your budget right now. Don’t worry! There are small additions you can make to get more out of the closet you have! Consider adding some closet accessories to your existing closet. 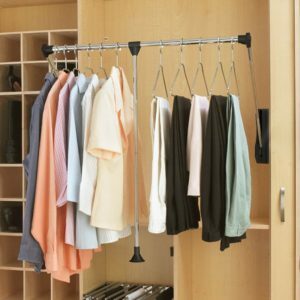 Closets accessories, like tie racks, belt racks and pant racks, can easily be added to an existing bedroom closet, take up very little space and can help add much needed functionality and storage. See our gallery of closet accessory options to learn what options you might incorporate. For other closets, such as craft, mudroom or home office closets, consider adding just one or two smaller components such as an additional shelf, a unit of drawers or a few pull out baskets for much needed additional storage. These little changes can make a big impact with minimal investment. No matter what your approach, Closets For Life can help! 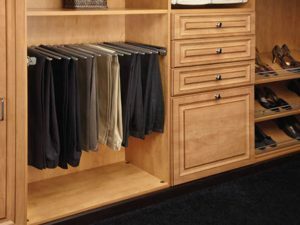 From expert organization advice, to adding minor additions, to designing and installing an entire closet system, Closets For Life has the experience and expertise to help custom tailor a solution to your needs and your space. We offer free in-home consultations and will follow up our consultation with free 3D design. What do you have to lose? Contact us today! 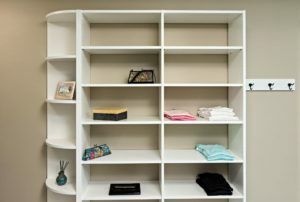 Custom organization is often something put on a homeowner’s wish list, a ‘that would be nice but…’ item that gets put off due to other more pressing home needs. It’s something that will be used every day for years to come, rather than forgotten after a few weeks or months. 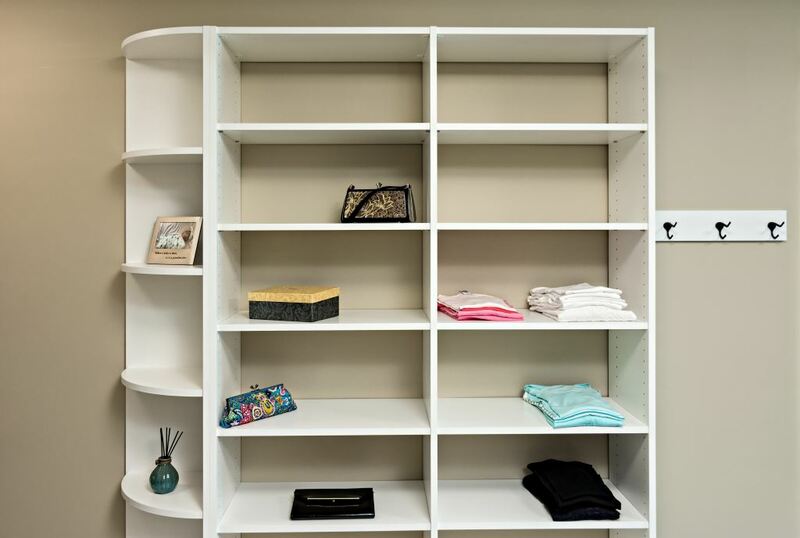 Built-in home organization can improve the value of a home, meaning it’s a gift that gives back! So, what kind of organization projects make the perfect gift? We’ve highlighted just a few options below but really; the only limit is your imagination. If you like what you see or would like to talk with us about your ideas, contact us to schedule a free in-home consultation. And don’t worry, there’s still plenty of time. Whether you want to get the project done in time for Christmas, or want us to provide you with a certificate to present so you can plan together after the holidays, Closets For Life can make it happen! Does you loved one’s closet overflowing with clothing? A custom closet system could be the perfect gift. With a variety of features available such as built in drawers, shelving, shoe racks and islands, we can create a design that specifically fits both the needs and space of the recipient. 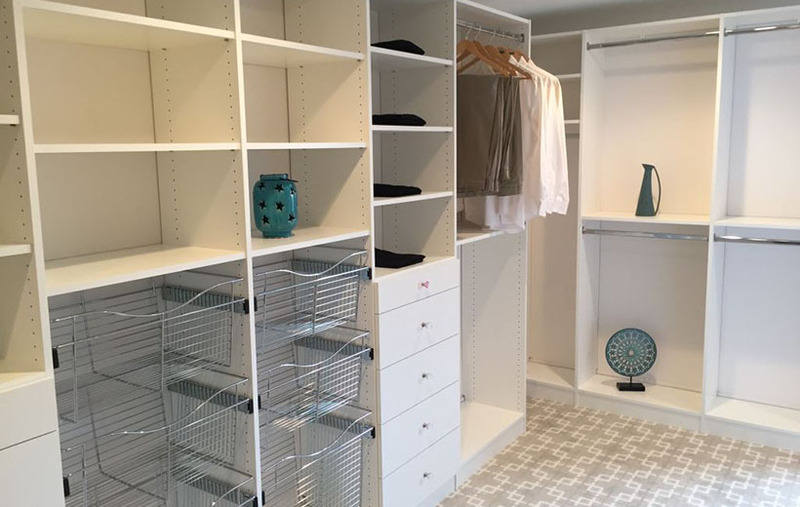 Whether designing for a reach-in or walk-in closet, a custom closet system can triple storage capacity. Imagine your loved one walking into their new closet each day and thinking how much they appreciate this gift. And, if you just happen to share a closet with the recipient, you’ll get to enjoy the gift as well! View our galleries of walk-in closet systems and reach-in closet systems closet projects for inspiration. Custom mudroom organization is something most moms dream of. If a home’s mudroom or entry is overwhelmed with coats, shoes, backpacks, sports equipment and more, we can absolutely guarantee that the mother of the house will be overjoyed to receive the gift of custom mudroom organization. Don’t have a mudroom? Even better! Without a designated area to ‘catch’ all these items, custom built-in open lockers or a front entry closet system will be even more appreciated! Visit our Mudroom storage project gallery for ideas and inspiration . If mudroom organization is the perfect mom gift, then the perfect dad gift is garage organization. With an amazing array of options including bike hoists, wall storage for rakes and shovels, ceiling racks, tool storage, custom cabinetry and so much more, you can turn any garage into the man cave most dads dream of. Thinking winter isn’t the right time to tackle this kind of project? It’s actually the perfect time. Tackling garage organization projects in the winter months means the garage will be ready to go by spring. Visit our garage storage project gallery to learn more. Is the gift recipient an avid wine aficionado or love to entertain? 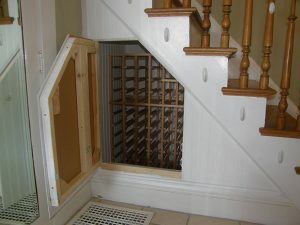 Having a home wine cellar can save money and time by allowing wine to be purchased by the case and preserving the longevity of a bottle’s contents. Plus, let’s face it, it’s pretty awesome to be able to say, ‘Just let me run down to my wine cellar to select a bottle for dinner.’ Worry you need to dedicate a whole room to have a home wine cellar? This is not the case. 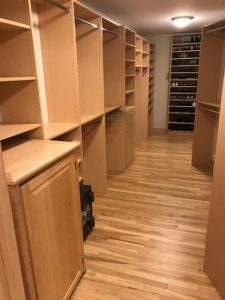 View our wine cabinets and wine cellar photo gallery to see wine cellar projects both big and small, from wine cellars with 900+ bottle capacity to a small wine cellar built into the base of a staircase. How fun would it be to gift a bottle of wine with a note that says’ Wine Cellar Included’? Love the idea of giving a gift of home organization but looking for something a bit smaller? Consider gifting a closet accessories or two. You would be surpised how accessories like valet rods, tie racks and pant racks can impact the storage potential and use of a space. 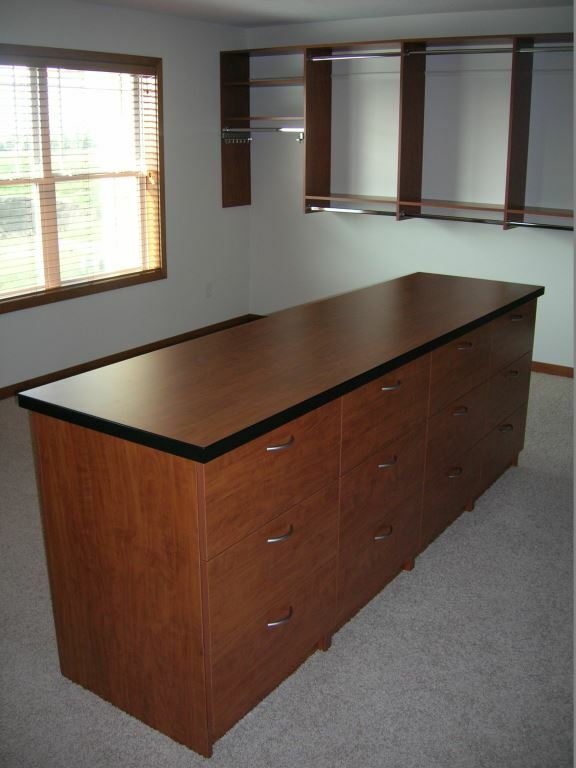 Have a dark closet space? Give a gift of lighted closet rods. Or perhaps you have grandparents on your list? Closet accessories like a pull-down closet rod make reaching clothes easier, a gift that is sure to be used and appreciated. Visit our closet accessories and organizer systems photo gallery to see the many closet accessories we carry. Whether you’ve moved to a condo as an empty nester or as a young, newly married couple, one challenge everyone will face is lack of storage. With their beautiful views of the city skyline and easy accessibility to everything fun, urban living offers many perks but shortage of storage is a common struggle. Never fear, there is a solution. Here are 5 ideas to maximize condo storage space. 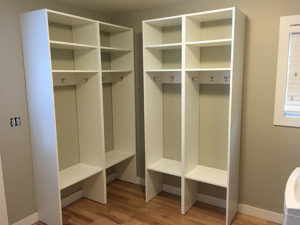 While many newer condos come with walk-in closets, it’s likely that you still need your condo closets for hold more than you may have in a bigger home. Perhaps your bedroom doesn’t have room for a dresser or you don’t have a spare bedroom closet to store off-season clothing. 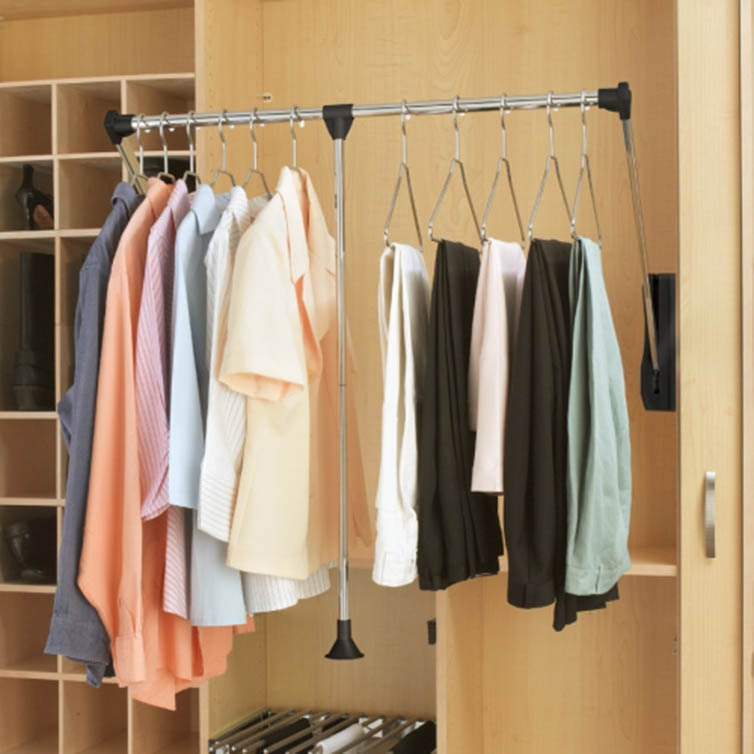 Installing a custom closet organization system is a sure-fire way to maximize your condo closet storage space. A good closet designer (like Closets For Life!) will be able to help design a custom solution that perfectly suites your needs, incorporating the right ratio of drawers, shelving and hanging space to double or even triple your closet storage. 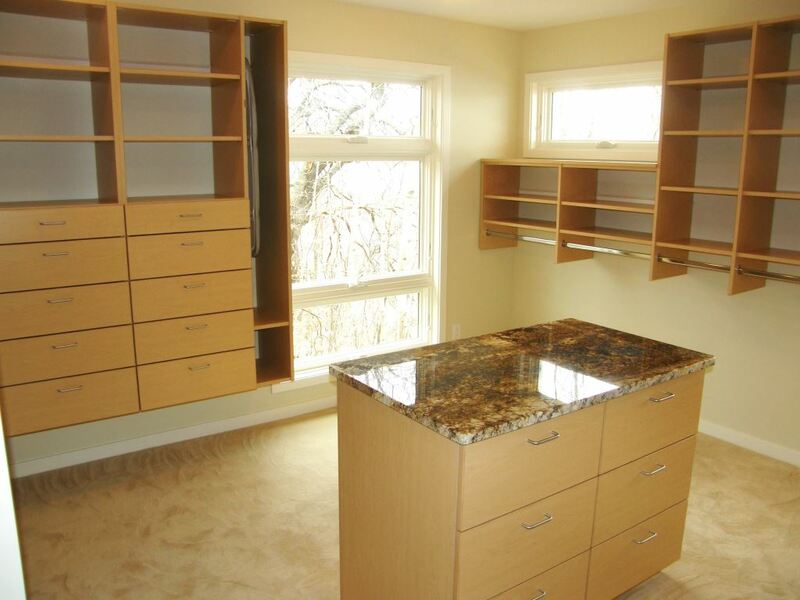 Visit our custom closet system project gallery for more photos and ideas. Closet accessories including pants racks, tie racks and pull out clothes hamper drawers are like icing on a cupcake, the perfect topping and compliment to a closet organization system. These specialty storage items are guaranteed to be the favorite space saving features of your closet and, frankly speaking, you can’t have too many. Incorporating these features throughout your closet will help you get the most out of your closet. Visit our closet accessories photo gallery for more examples of space saving closet accessories. 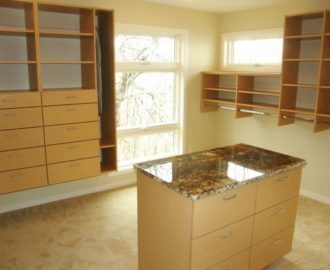 Condo kitchens typically are short on cabinet storage. Make the most of your kitchen storage with pull out cabinet shelves. While pull out shelves don’t necessarily open up an additional storage, they do increase usability of the space you have. Especially in lower cabinets, pull out cabinet shelves make it easier to reach items in the dark depths of your cabinets. This will allow you to better utilize the space that you have. 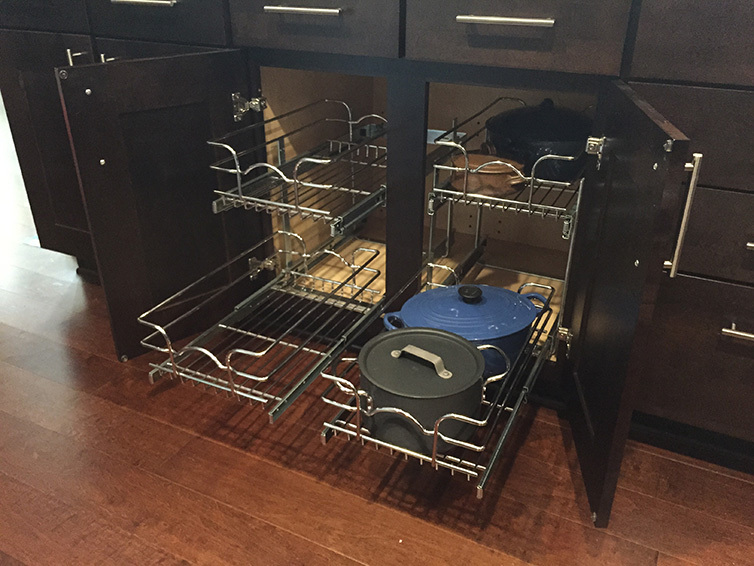 Click here for more ideas for maximizing kitchen storage ideas. Mudroom, what mudroom? 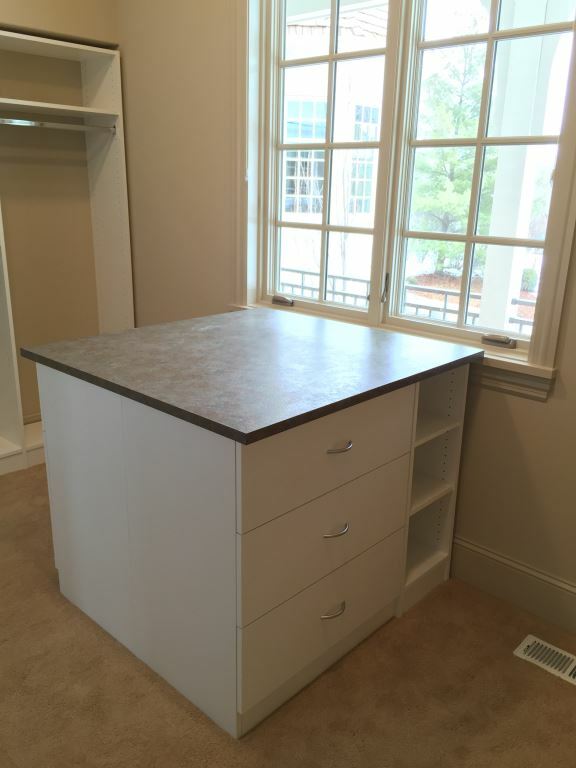 Many condos typically lack what most of us would consider a mudroom space. However, in snowy states like Minnesota, having somewhere to store outdoor gear and boots is critical. You don’t need a formal mudroom space to have mudroom storage capacity. 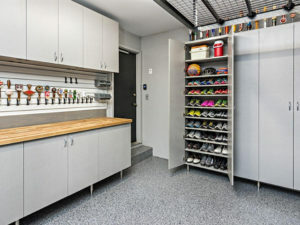 Adding open locker-style storage to a wall inside the entry or a custom storage system to the entry closet can significantly increase outdoor gear storage space in your condo. Visit our mudroom and front entry organization project gallery. Get the most out of the smaller laundry spaces typically found in condos by adding custom storage. If floor space is scarce, consider features that utilize wall space. Wall mounted cabinets can provide valuable laundry supply storage. 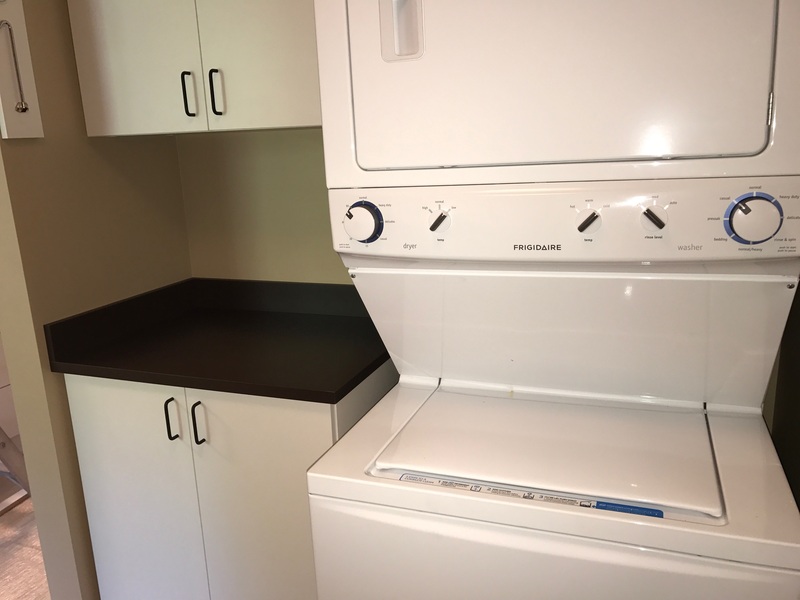 For folding space, consider installing a counter over a front loading washer and dryer. And don’t forget a wall mounted hanging rack for hanging clothes out of the dryer. 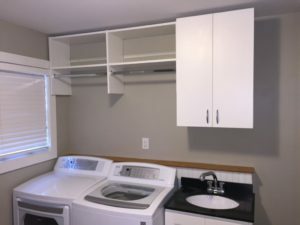 Utilizing as much wall space as possible will have your condo laundry space working overtime! Visit our laundry organization project gallery for additional laundry space organization inspiration. 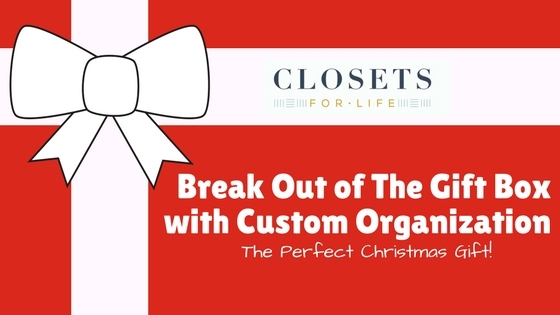 Here at Closets For Life, a locally owned custom organization company in the Minneapolis/St. Paul area, we’ve helped countless condo owners utilize their storage space wisely. Below is a list of just some of the many local Minneapolis and St. Paul condos we’ve done work in. If you’re looking to maximize your storage space in a condo or a home, big or small, we have smart solutions and creative design ideas that will have a dramatic impact on storage, adding value, beauty and organization to your life. Contact us for a free in-home consultation! Many homeowners without a master bedroom walk-in closet have found a creative solution to creating the closet they’ve always dreamed of, transforming a spare bedroom into a closet! Annexing a spare bedroom next to the master bedroom and converting it into a walk-in closet can be as simple as adding a doorway and a custom closet organization system. Viola! A spacious walk-in closet that adds value to your life and your home. This was exactly what a recent client of ours did. Greg and Jane live in a home with traditional reach-in closets. With their kids grown and out of the house, they decided to convert one of the bedrooms into two separate spaces they’ve always wanted, a walk-in master bedroom closet and a laundry room. Adding a doorway from their master bedroom bathroom opened up the flow of the space, providing one entrance from the hallway and the other from the bathroom. A half-wall was added to divide the space between the closet and laundry area while still allowing convenient access to either. 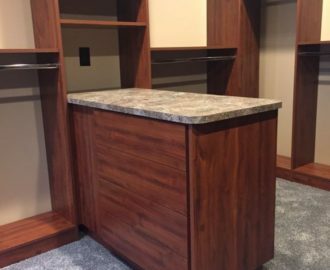 When we sat down with Greg and Jane at their initial consultation, they had specific features they wanted their walk-in closet to have. As avid travelers, they wanted a closet island for packing a suitcase on top. They also wanted a bench on the end of the island to sit down while putting on shoes. Jane wanted two drawers with built-in trays to easily store and organize her jewelry. With their frequent travels, she also wanted to be able to lock the drawers for security. Greg stated that he likes to hang items on hooks so we incorporated matching hook strips for both Greg and Jane in the design. Jane also had many items she wished to store on shelves, rather than hang, such as purses and t-shirts. A cabinet dedicated to shelving space was incorporated to offer flexible storage space Jane can use as she wishes. The curved end of the cabinet softens one entrance and also provides a place to display art and pictures. Finally, after going so long without a walk-in closet, Greg and Jane were eager to incorporate closet accessories that would help them utilize the space to its full potential. Closet accessories included in the design are pants racks, belt racks, tie racks, valet rods, jewelry trays and shoe shelves. 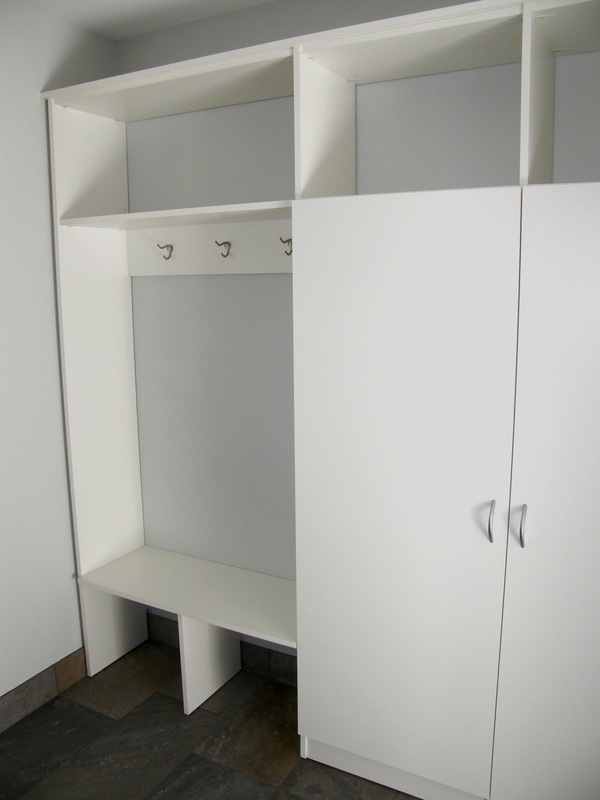 Within the adjacent laundry room space, we designed a base and upper cabinet to store laundry supplies. The base features a laminate top for folding clothes. We also included a hanging rack on the opposite wall. What a wonderfully short walk from taking clothes out of the dryer to the closet! All of the cabinetry was created with a clean, fresh white finish. The chocolate micro dot laminate tops match the chocolate cabinets in the bathroom, making the closet and laundry room feel cohesive rather than added on. The finished project is simple, yet sophisticated, and Jane and Greg are loving their new space! Contact us to see how we can help you create the closet you’ve always wanted. 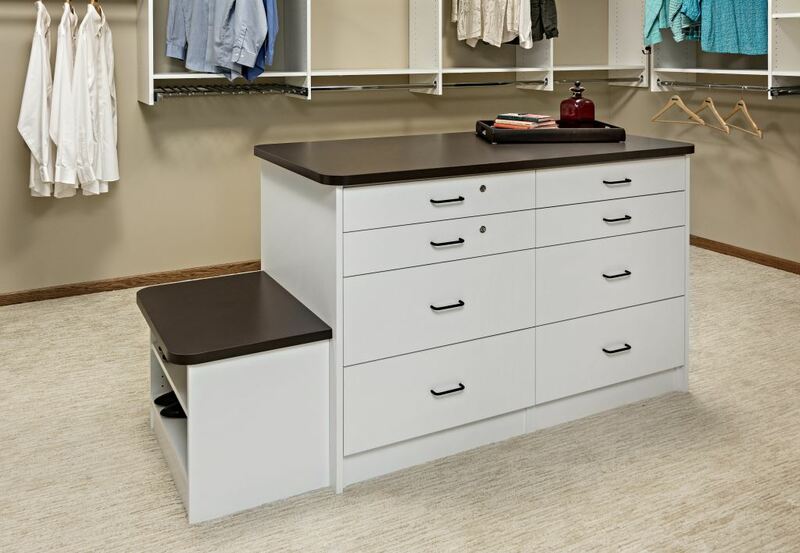 Providing that space allows it, a closet island is a must-have feature in a walk-in closet. Closet islands are easily customized and there are many advantages to including an island in your walk-in closet design. Before deciding if a closet island is on your wish list, first determine if your walk-in closet has adequate space. 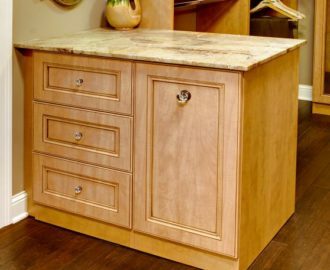 The depth and width of a closet island is dependent on what features you desire. 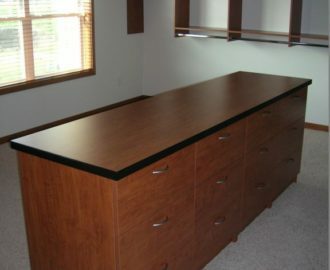 However, closet islands are generally at least 30″ deep, deep enough for drawer storage on each side. Width varies according to the features selected. The other space consideration is clearance around the island. Although 30″ is enough clearance, at least 36″ of clearance around each side is recommended to allow you to comfortably walk around the island. In addition to adding functionality, incorporating the features listed above will open up space in other areas of your closet and bedroom. 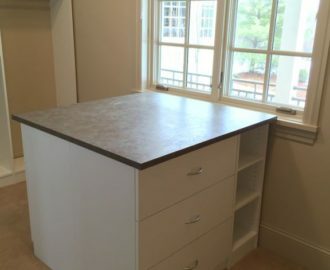 For example, drawer space in an island eliminates the need for a dresser in the bedroom and opens up hanging space in the surrounding wall closet space. Pull out hamper drawers open up floor space that might otherwise be taken up by a clothes hamper. 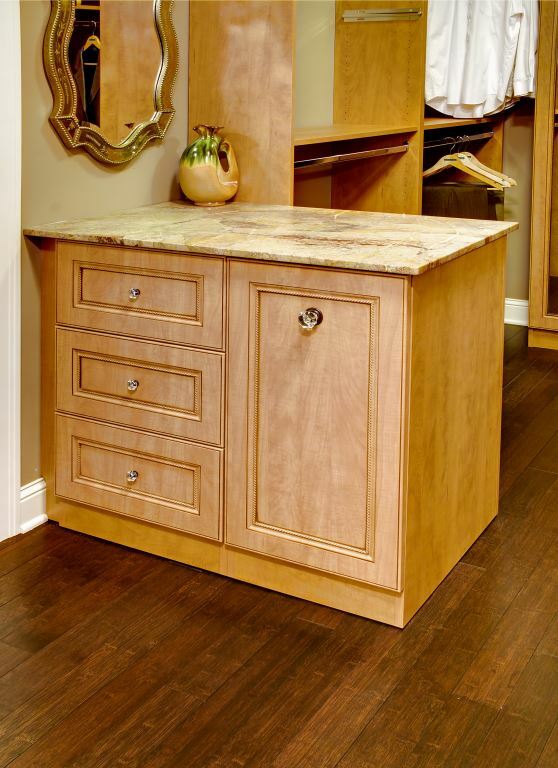 All of this added space and functionality aside, a closet island adds a ‘wow’ factor to a walk-in closet. Combined with striking choices in materials, a beautifully design closet island is an element that adds drama to the space. 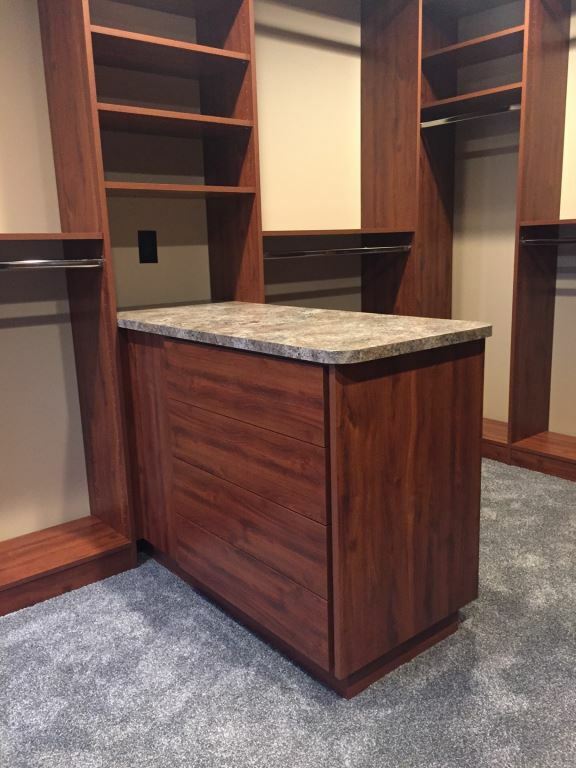 While pre-fabricated options are available, using a custom closet design company such as Closets For Life will ensure you get the best options, materials, and design based on your space and your needs. With either option, begin by spending some time to assess your storage needs and your available space. This will speed up the design process and ensure that you begin with realistic expectations of your space. 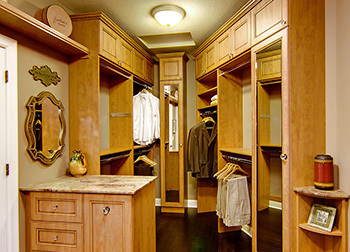 For more examples of beautiful walk-in closets and closet islands, visit our walk-in closet photo gallery. 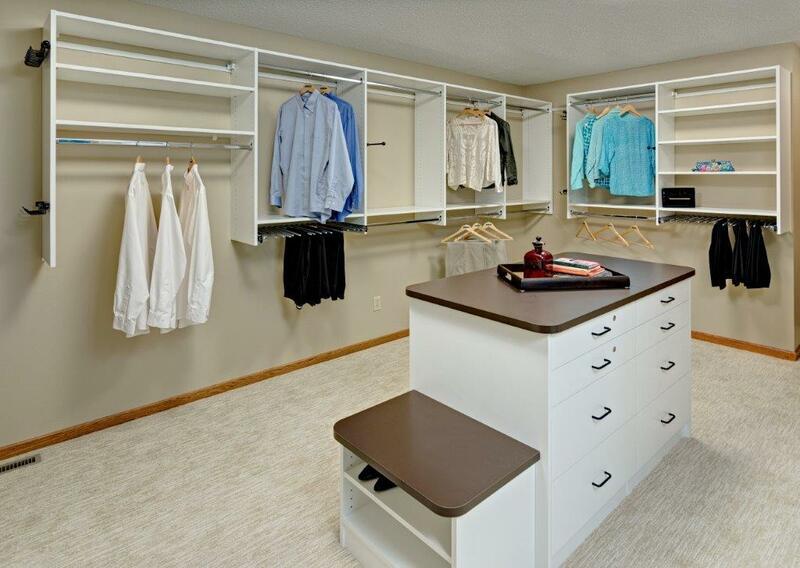 When you are ready, contact Closets For Life to schedule a free in-home consultation. We’ll come to your home to measure your space and discuss your needs and ideas. Within two days, you’ll have a free design and price quote. Once the design is finalized, all pieces are custom designed and are generally installed within two weeks. Let us help you create a beautiful closet space to be enjoyed for years to come!